In 2017, my design was chosen for Rogers Park's Mile of Murals, a Chicago public art program that started in 2007. The program is managed by the Rogers Park Business Alliance. The call for proposals asked for a design around a word or phrase. I chose Resilience because it speaks to the strength of the Rogers Park community, where I have been fortunate to locate much of my own art practice. Rogers Park is vital and diverse, and it's still a place where strangers talk to each other. The people in the mural are all characters from my online graphic novel, Freaks' Progress. That comic was itself inspired by Rogers Park and other places in the city with a similar energy, so it's very fitting that this mural lives where it does. I worked with an amazing team on this piece. Jason Schroeder, Dalia Carrillo and Cesar Moyorido all put their energy and individual stamp on the wall. 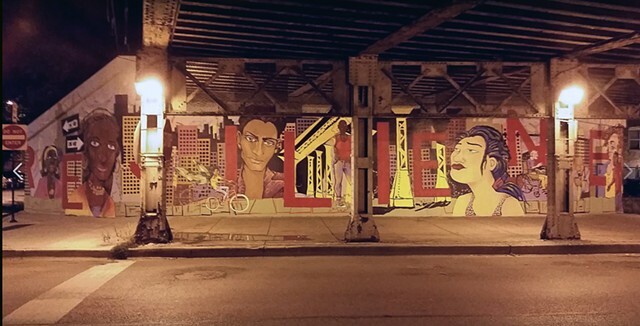 The People of Rogers Park love this mural. While we worked on it, they cheered, honked their car horns, stopped to thank us, and even brought us coffee and doughnuts. One of the crew said he was almost sorry to finish it because he was going to miss being a neighborhood celebrity. We all hope that Rogers Park can enjoy this wall for years to come!